What it’s about: Before Cleopatra reigned at the end of the Ptolemaic Dynasty, Egypt had only a handful of female rulers—there were definitely three and may have been five, depending on how far back you want to go in history, which doesn’t tell us for sure the genders of a few of the rulers. At any rate, that number would have been one fewer if the male pharaohs had gotten their way. Hatshepsut was the fifth pharaoh of the Egypt’s Eighteenth Dynasty. Technically she was the official regent to her nephew (and successor), Thutmose III. But as he was only 2 years old when Thutmose II died, Hatshepsut was sole ruler of the country until he came of age. Late in Thutmose III’s reign, someone tried to destroy all evidence of Hatshepsut’s existence, destroying her likeness in statues and painting her over with male figures in hieroglyphics. They did this very clumsily, thankfully, as archaeologists and historians were able to restore her to history. Today, she’s regarded as one of Egypt’s most successful pharaohs. Biggest controversy: This wasn’t controversial by ancient Egyptian standards, but Hatshepsut’s family tree makes the Lannisters look wholesome by comparison. Her husband, Thutmose II, was also her half-brother. He most likely married her because Hatshepsut was the only child of Thutmose I and his first (and more important) wife, Ahmose. Thutmose II’s mother, Mutnofret, is identified as “a secondary wife,” so he would have been seen as a less legitimate claimant. Any hypothetical brother Hatshepsut had would automatically be the heir, so marrying her made II the obvious choice for the throne. Trouble is, he and Hatshepsut only had one child, a daughter named Neferure. Although her mother was effectively pharaoh, Neferure couldn’t inherit the throne, so one of Thutmose II’s children by another wife—Thutmose III—was next in line. Researchers are divided on whether Neferure died during her mother’s reign, or bore Thutmose III a child—Amenemhat—who died before his father, missing his chance to take the throne. Strangest fact: We’re not actually sure who tried to erase Hatshepsut from history. Conventional wisdom was that her stepson/nephew/successor wanted to erase any suggestion that someone else had ruled in his stead for half his life. But as more of the historical record was uncovered, it was clear that the erasure happened late in Thutmose III’s reign. More so, while Hatshepsut ruled, Thutmose was her most successful general, as well as an athlete, author, historian, botanist, and architect. 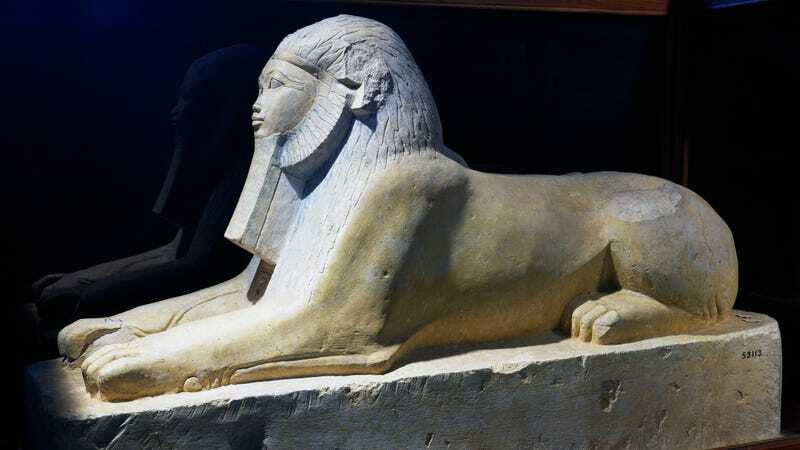 He seemed to succeed at everything he attempted, and once Hatshepsut died, enjoyed a prosperous 33-year reign in which he expanded Egypt’s territory to its furthest extent. No part of that suggests someone who held onto bitterness towards his aunt for decades and then defaced every depiction of her. The more likely suspect is Amenhotep II, Thutmose III’s son and heir, who co-ruled during Thutmose III’s later years. As a son of “a minor wife of the king,” his claim on the throne was shaky, and erasing his great-aunt’s rule solidified his claim, although Wikipedia isn’t clear on how. Thing we were happiest to learn: Hatshepsut seems to have been a great pharaoh. Egyptologist James Henry Breasted refers to her as “the first great woman in history of whom we are informed.” A previous female pharaoh that we know about, Sobekneferu, ruled for less than four years at the end of a fading dynasty. By contrast, Hatshepsut ruled for 21 years at Egypt’s peak. She enriched the kingdom by rebuilding trade routes, and built so many monuments that virtually every museum with an Egypt exhibit has at least one (the Met has a dedicated Hatshepsut room), including twin obelisks which were the highest in the world, one of which still stands today. The Valley Of Kings came about because subsequent pharaohs wanted their burial monuments built near the grandiose mausoleum Hatshepsut had built for herself and her father. Thing we were unhappiest to learn: Someone went to a lot of trouble to try and erase Hatshepsut from the historical record. While she was one of Egypt’s great builders, many of her statues were smashed or vandalized, and her images were chiseled off of stone walls, “leaving very obvious Hatshepsut-shaped gaps in the artwork.” She was also sometimes painted (or painted over) with a beard—it isn’t clear if this was an attempt to replace her with a male figure after the fact, or whether even a woman would have been depicted with the stylized beard symbolic to the pharaohs. Best link to elsewhere on Wikipedia: Pharaohs were considered divine, but Hatshepsut also claimed to be descended on her mother’s side from Mut, the goddess who represented the waters from which all life was born. Mut is part of the Egyptian pantheon, a far-reaching list of gods who changed gradually through the eons of Egypt’s existence. Further down the Wormhole: We were going to use list of pharaohs as “best link,” but started reading up on the Ptolemaic Dynasty (who had more female rulers than the rest of Egyptian history combined, owing to husbands and wives co-ruling). The family/palace drama is what historical scholars describe as b-a-n-a-n-a-s, so we’ll remain in Egypt next week as we look at the ancient kingdom’s final 275 years and the madcap procession of rulers therein.